You’re invited to a party, you have two questions: What should I wear? What should I bring? And so it goes with a hike. You’re invited, say, to one of our beginner-friendly Hike NC hikes and the same questions arise: How should I dress? What should I bring? Fortunately, the answers for a hike aren’t nearly as daunting. We address each question separately. What should I wear on a hike? Footwear. At some point you may advance to trails where more specialized footwear is required to handle the rocky, rooty terrain. But starting out, for a hike of less than three miles on foot-friendly natural surface, the same shoes you wear for a walk around the neighborhood or on your lunch-hour walk should suffice. Running/walking shoes can handle the job, just make sure they have a good fit and that the soul isn’t worn (a grippy soul comes in handy on natural surface trail). Tip: Five minutes down the trail your laces may loosen; take 30 seconds to stop and snug ‘em up; it helps ward off blisters. Clothing. Again, starting out, the clothes you walk in should be fine. Make sure they’re comfortable and don’t bind. Be advised that even on a cool day you will warm quickly: you may want to start wearing a layer less than you might think comfortable. Speaking of layers, that’s the best way to stay warm and regulate heat. On a 50-degree day, for instance, you may start with a long-sleeve shirt or sweatshirt and a windbreaker: shed the windbreaker once you get hiking, then put it back on should you stop for a break. Also: avoid wearing cotton: it gets wet, it stays wet. In cool weather, that cool, damp fabric against your skin can quickly drop your body temperature. Synthetics and wool are preferred. Water. Always, always get in the habit of bringing water on a hike. Even on a cold day, even on a short hike. Nothing will bring you down — both physically and mentally — faster than becoming dehydrated. It’s such a simple fix — made even simpler if you’re going on one of our Hike NC! Hikes and score a free collapsible water bottle! Snacks. Just a notch below water in importance, but still important. 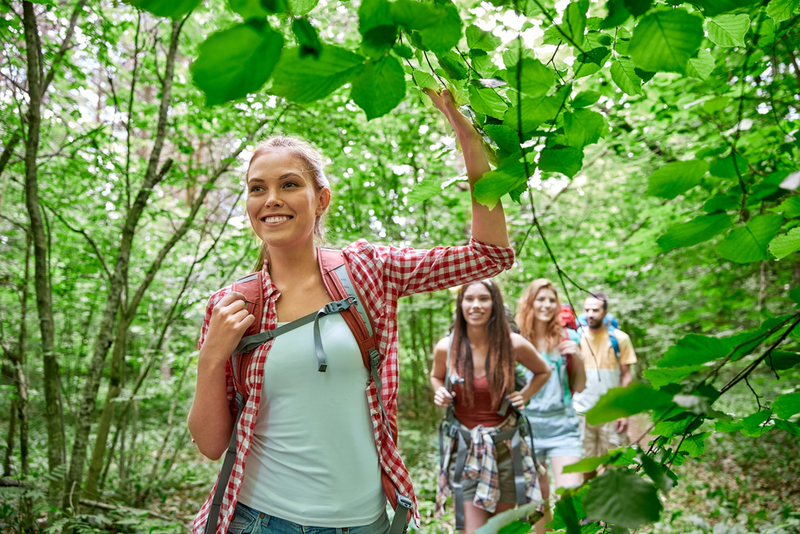 You burn extra calories hiking — a 150-pound person hiking at a 3 mile per hour pace over moderate terrain will burn about 350 calories in an hour. Having a favorite snack on hand — M&Ms, raisins, nuts — will help keep your body fueled and your spirits up. Camera. You’ll want to share this experience with friends, the good, the not so, the amusing. You’ll be amazed at how much happier you look in the woods (it’s that smile!) and since your phone likely has a camera, why not use it? Don’t be shy about capturing the experience. Tag @bcbsnc on Twitter or Instagram or use #HikeNC to share your photo with other hikers in North Carolina.